Find this beer and more at Full Throttle Bottles in Georgetown. Full Throttle will actually be hosting a tasting with Sound Brewery tomorrow night (Wednesday, January 11) from 5pm to 7pm where you will be able to taste this and other beers from the brewery. I’ll be on hand as well, so come say hello! Intro: Since opening the brewery in Poulsbo on the Kitsap Peninsula early in 2011, Sound Brewery has been impressing beer drinkers on both sides of Puget Sound. While they have a focus on Belgian-style beers, they have a well-rounded lineup that includes German and American styles as well. In addition to draft sales, you can find 22oz bottles of some of their beers at local Puget Sound retailers. Description: Pours a brownish mahogany with thin head. Strong dark fruit comes out in the aroma with lots of raisin. The taste is more dark fruit with light caramel malt and some banana flavor rounding things out. Just a bit of alcohol makes an appearance along with some spicy phenols, but this is incredibly smooth for an 8% ABV beer. Medium body and carbonation lets the flavors shine without coming across as a heavy beer. The finish is farily dry and balanced. This probably isn’t quite as complex as some of the classic Belgian examples, but it is an impressive effort and well worth picking up. Comforting aromas of chocolate malt and dark toffee, with a hint of banana and stone fruits. 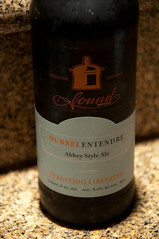 A dark abbey style ale with a subtle rich maltiness and a dry, spicy finish. Great name for a Belgo Dubbel!